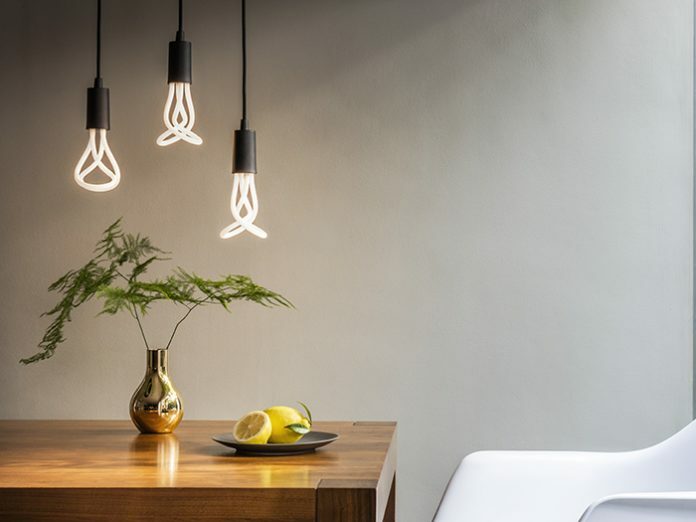 (USA) – Plumen launches new 001 LED decorative lamp in US and Canada, raising the bar in contemporary design. The 001 LED gives an exceptional light quality, is even more efficient, yet retains the iconic 001 lamp shape thanks to new technology devised by Plumen. The 001 LED unites form, function, and innovation; the perfect recipe for beautiful lighting and has been engineered to create a high-performance product in every regard. A new patented LED construction replaces the previous compact fluorescent technology, meaning greater control, performance and longevity. The double-looped form designed by Plumen and Samuel Wilkinson remains, making it instantly recognisable. The lamp is now completely dimmable and has a lifespan of over 20,000 hours, equating to almost 20 years of average use. The new inner-workings of the Plumen 001 LED allow for a sleeker form factor, which in turn means the lamp sits elegantly in many more fittings and shades. Materially it is all change; the Plumen 001 LED has a ceramic housing, creating a more premium finish that is also more environmentally responsible, while the illuminated tubes have a matt, bone-like finish. Neither aluminium nor mercury are used, and the lamp can be fully dissembled, ensuring it is 100% recyclable. Plumen pioneered the world’s first energy efficient designer lamp with the original 001. It quickly became an icon of forward-thinking and problem-solving design after its 2010 launch. Cooper-Hewitt, MoMA (New York), The V&A (London) and The Design Museum (London) hold the original 001 in their permanent collections, a testament to its place in the contemporary design canon.